The ancient Agora of Athens is a major archaeological site, and a long shadow of influence across the globe. It was the cauldron that brewed some of the most important ancient Greek concepts. Agora is the place where the direct Athenian Democracy took root and flourished, and where Socrates strolled, taught, and died. Ancient Agora is a small place physically, but it casts a long shadow across the entire earth. This is a big statement, but well deserved for a place that was the heart of idea exchanges during the classical era. The ideas forged in this marketplace have influenced the way we think to this day. “Agora” in Greek literally means “a place of gathering” and the Agora of Athens was the heart of Athenian life in Ancient times. 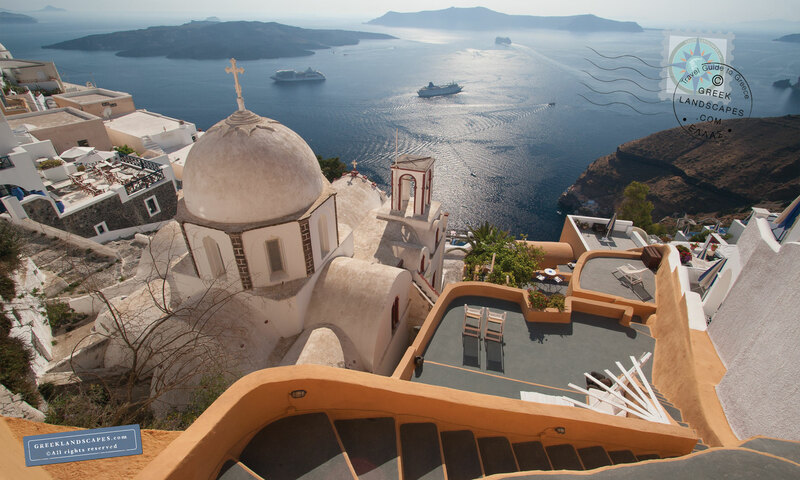 For centuries It served as a busy marketplace where merchants and artisans congregated to buy and sell, but it also provided a platform for the Athenian political and intellectual life. This is the place where Aristocrats and Tyrants enforced their rule on their Athenian subjects, and the place where the concept of “direct democracy” was forged in the Classical era. The Agora was the physical place where every Athenian citizen gathered to conduct their business, participate in their city’s governance, decide judicial matters, express their opinion for all who cared to listen, and elect their city officials. For every free Athenian citizen participating in such “common” activities was not merely a duty, but a privilege and an honor. In fact, the term “idiot” (idiotis=he who acts on his/her own) was used to mock those who avoided participation in the common citizen activities. The lacy arguments of ancient Greek philosophers who strolled the ground leading their pupils scattered in the winds throughout the globe, and the ruined stones speak of fiery orations only in a silent sort of way. Despite the magnificent rock of the Acropolis that commands the landscape of the Agora from above, and the majestic presence of the Temple of Hephestus that balances the Parthenon across the plateau, the Agora remains a shy, humble and tranquil place. The Agora displays the tranquility that comes only from having gazed upon the heights of absolute greatness, before plunging into the depths of infinite cruelty. Instead, a mass of silent ruins invite us to follow the historical clues and to unravel our own mind’s Ariadne’s thread all the way back to the Theseus’ era of heroes. The ancient Agora’s presence transcends centuries and cultural influences from prehistoric times to the modern era. In the Agora museum, artifacts date back to the stone age. The site flourished form several centuries afterward, reaching its apogee in the 5th century BCE, during the Classical era. Through its long history, it facilitated the spectacular transformation of the 1200 BCE Mycenaean civilization to the rational Athenian Golden era 500 years later. Afterwards, it witnessed the transition of the practical Roman culture’s morphing into the spiritual Byzantine centuries. The buildings of the Agora were destroyed in 480 BC by the invading Persians, only to be rebuilt again in the subsequent years of the 5th century BC when Athenian culture flourished into a superpower with immense cultural, political, and military influence. It was again plundered in 86 BC by the Romans, and was slowly rebuilt by the same conquerors who added many new buildings like the Odeon which occupies the center of the excavated Agora. In the next few centuries the place remained the center of activity in Athens and suffered several times at the hands of a multitude of invaders, until it was razed by the Slavs in 580 AD. 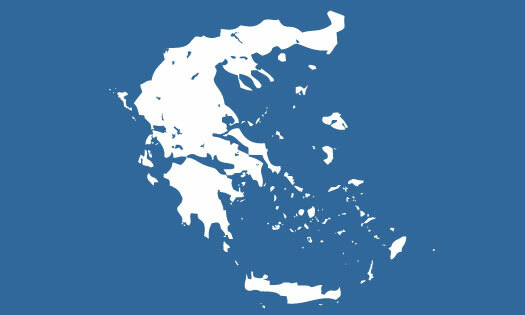 After that, it remained uninhabited until the middle of the 19th century when modern Greece won its independence from the Ottoman empire. The ancient Agora site is relatively level with many foot paths which meander pleasantly around small trees and historical events, betrayed by scattered ruins of all shapes and sizes. The Agora of Athens with the Temple of Hephestus. The most visible monument is the temple of Hephestus (or Thesion) which still adorns a low hill in the Northwest end of the Agora. The temple’s construction began in 450 BC and it is still preserved in remarkable shape to this day. In many ways the Hephaesteion resembles the Parthenon, though it was built much smaller in scale. It is one of the best preserved Doric temples of the classical period. It is of the Doric order, and in antiquity it housed two bronze statues of the goddess Athena and Hephestus the god of fire and metalsmithing. It was built adjacent to the area where most of the bronze and iron working foundries were found, and since Hephestus was the god of metalsmithing, its location around the industrial center of the agora seems appropriate. 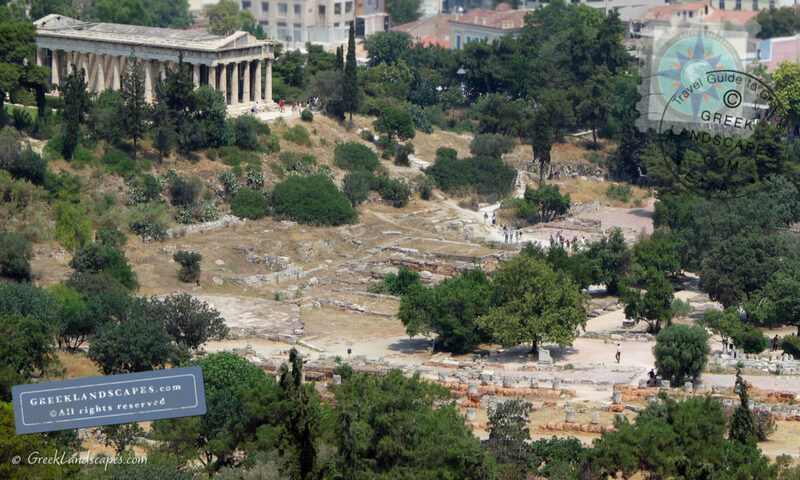 The temple is visible from atop the Acropolis, and it is a treat to see from the HSAP train which connects Athens and Piraeus and its track which passes very close to the ancient temple. The “Thesion” train station is within walking distance to the south entrance of the Agora of Athens. The construction of the Hephaisteion began at the same time as the Parthenon construction around 450 BC and was completed probably some time around 415 BC. The temple was adorned with the traditional Doric metopes which depict the feats of Theseus (the reason the monument is sometimes referred to as “These um”). The inside set of columns, over the porch, support a continuous Ionic Freeze which is decorated with high relief sculptures depicting the fight of the Centaurs and Lapyths. Unlike the Parthenon however, the decorated friezes do not wrap around the building but instead appear in the front and back elevations. The metopes of the front are ornate with relief sculptures, but are empty at the flanks with the exception of the four foremost panes that depict the Theseus legends. The Pediment was also adorned in ancient times with sculptures of which only fragments remain today. The approach to its interior is forbidden, but you may see it from the front door. The Stoa of Attalos which dominates the East end of the site was built around 150 BC and was reconstructed in the 1950’s. Today it functions as an example of ancient Stoa architecture, and as archaeological services office and storage. But on the ground floor it houses the Agora museum. The ancient Agora Museum exhibits a collection of artifacts unearthed in the surrounding area. 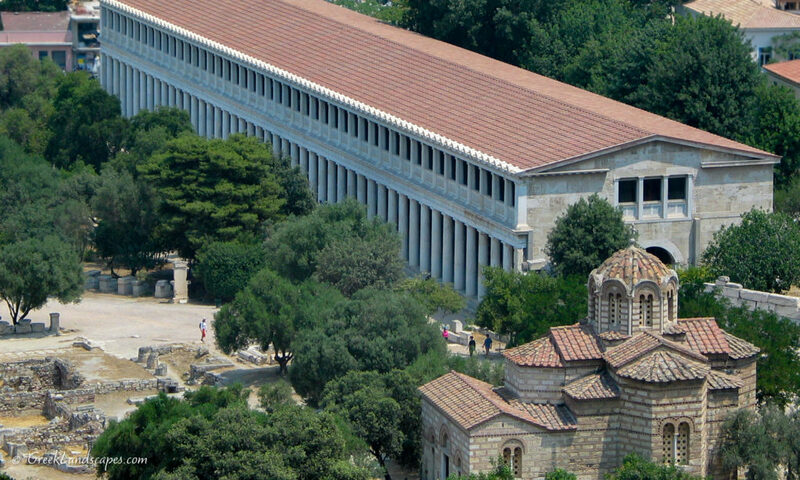 The Stoa of Attalos frames the Agora on its east end and separates it from the Roman Agora. It is a museum worth visiting for its exhibition, that of a variety of statues and common artifacts from the Agora excavations. The Byzantine era Christian Church of the Apostles is well preserved in the Southeast corner and it houses several wall frescoes, while all other buildings expose only their foundations. Among those, there is a great variety of buildings that one would expect to find in a marketplace such as stores and workshops, as well as many structures that housed public events and government functions. As you stroll through the ruins of the Agora, you can’t escape the unbearable weight of history that hovers about the place. And yet, the modest ruins visible today betray none of the splendor of magnificent buildings that once adored the landscape. The ruins are a testament to both the legendary Classical Athens, but also a witness to the turbulent history that followed in the next 2500 years. Athens has suffered through invasions of every imaginable foe in its long history. Accordingly, the ancient Agora, as the central place of political life was destroyed and rebuilt numerous times. You may also visit the Agora Museum which is housed in the Stoa of Attalos. You can enter the Agora with the “unified ticket” that allows access to other archaeological sites in the area, most notable of which are the Acropolis, the Roman Agora, Hadrian’s Library, and Kerameikos. Allocate anywhere between 30 to 60 minutes for visiting this archaeological site. It’s best to walk around the open air ruins first and visit the museum later. As with all archaeological sites in Greece, it’s best to visit around 9:00 AM before the heat and the crowds become an issue. Buy bottled water when you exit the Metro station at the nearby kiosk. There is a water faucet, a small shop, and bathrooms near the museum entrance inside the Archaeological site. Wear light clothes and comfortable shoes. The site is relatively flat and easy to walk around in flip-flops, but you should wear a hat and sunglasses. In the summer, the heat can be considerable even under the shade of the few trees that adorn the place. Adrianou street is a good place to sit for lunch or to have a drink before of after your visit to the archaeological site. You can sit at a restaurant or cafe and relax in full view of the ancient Agora ruins and the Acropolis above. If you plan to visit the ancient Agora along with other ancient sites in the area, follow our free walking tour of ancient Athens. The archaeological site of the ancient Agora is in the center of the historic center of Athens and easily accessible by Metro. Use Line 1 and get off at either Monastiraki or Thesion. Both stations are about the same walking distance from the main entrance of the site. From both stations, walk about five minutes on Adrianou street to reach the entrance of the site. Arriving by taxi or car would leave you with the same walking distance since Adrianou street is a pedestrian road and no car can approach the entrance. You can visit the Acropolis on foot after you are done with your tour of the Agora by following the footpath up the hill, and you can reach Monastiraki and Plaka by exiting on Adrianou street. Click to open the Agora in aerial view and to get directions in a new window.